This tutorial will show you how to submit a form with easyui. 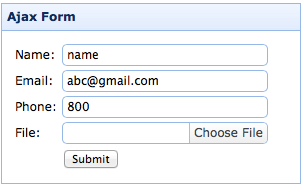 We create an example form with name, email and phone field. By using easyui form plugin we change the form to Ajax form. The form submits all the fields to the background server, the server processes and sends some data back to the front page. We receive the back data and show it out.